The significance of outboard marine engines in the boating industry is something that boat owners, independent shops and ship dealers have been aware of for decades. Outboard marine engines enable any boat or watercraft to freely navigate the open waters, giving boat operators the freedom to enjoy everything that lakes, seas and oceans have to offer. If attached to a watercraft, an outboard marine engine gives a boat the ability to traverse bodies of water with ease, making it a much faster and reliable option than rowing to your destination manually. Outboard engines provide boat operators a type of convenience that should never be understated. After all, it enables them to easily engage in various activities in the water without hassles, such as fishing and sailing. Fishermen utilize the engine to help them get faster to fishing spots and regular boat owners use the machine to maximize its many uses in the water. Outboard engines have several general uses that vary depending on their type. For example, an electric-powered outboard engine is generally used on a small craft to easily navigate small bodies of water, as an alternate method of propulsion on larger craft, or as repositioning thrusters for freshwater fishing. And portable outboard motors, which are usually fastened to the boat through clamps, is typically used for trolling board larger craft, to supply auxiliary power for sailboats, or to power canoes, dinghies, and other small craft. Since an outboard marine engine is usually used on a regular basis, especially by fishermen, it’s no stranger to issues that can hinder its performance and functionality. Depending on the problem of the engine, it can either have optimization issues that affect its overall performance or a problem in its motorized system that prevents it from functioning correctly. So if your outboard engine is currently going through some issues, it’s best to have them checked and repaired by professionals. Over the years we have helped countless of boat owners, independent shops, and dealers with their outboard engine problems. As specialists who have decades of valuable experience in outboard engine rebuilds and repairs, there is no issue that we can’t handle. 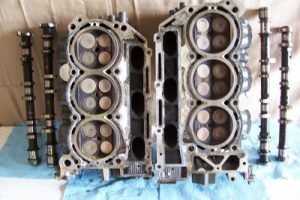 We are capable of restoring any outboard motor back to its former glory through our comprehensive services that include head repairs, lower unit rebuilds, remanufactured powerheads, and outboard machine shop work. Apart from being specialists in the outboard engine industry, our services are also available to customers both locally and internationally, which is why we are the preferred shop of dealers and independent shops from all over the world. So if you are having troubles with your outboard engine, you can either send it to us or arrange for a pickup then we will work our magic on it. And once your outboard engine is good to go, we will properly pack it and ship it right to your doorstep. If your outboard engine is suffering from issues that hinder its performance, you shouldn’t try to endure it because it will impair your watercraft’s ability to smoothly navigate the waters, so have it checked instead. Contact us now and we’ll see what we can do for your outboard motor.